Above: a very pale pink specimen of Gymnadenia odoratissima showing the cylindrical, lax inflorescence. This orchid is very similar to Gymnadenia conopsea but is reputed to be even more highly scented as well as having other characteristics which set it apart. Gymnadenia odoratissima is a tall (up to 50cm) very spindly plant which has between 4-8 basal leaves which are narrow and erect. The lax inflorescence is cylindrical when the flowers are fully open. The flowers are usually pale (occasionally darker) pink, and white forms are common in some areas. Each inflorescence carries fewer flowers than other closely related species such as Gymnadenia conopsea. 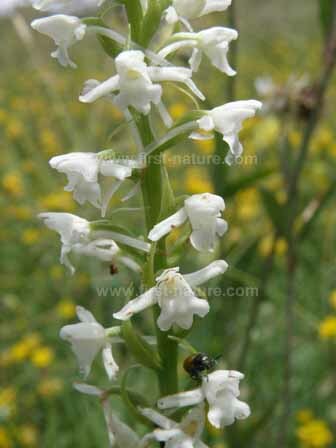 White-flowered forms of Gymnadenia odoratissima are common in central European mountains meadows. 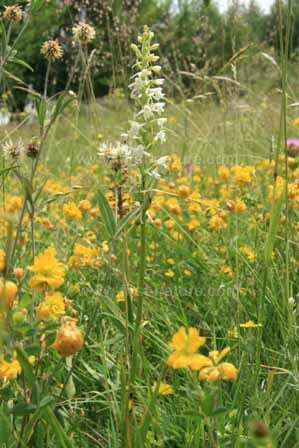 Gymnadenia odoratissima has a huge range and is recorded from Sweden in the north as far south as northern Spain. It is common in the central European mountain ranges and grows across a swathe of central Europe in Bulgaria, Slovenia, Italy and Greece among others. 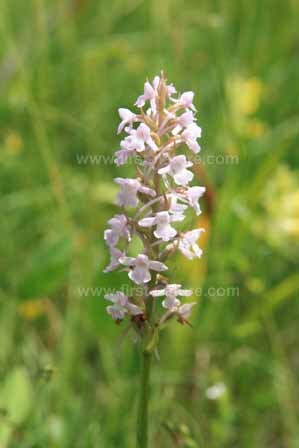 This orchid seems to be less specific in terms of habitat than other members of the genus and appears in meadows, mountain pastures (up to 2,700m) and in damp to marshy ground as long as the underlying ground is calcareous and the positions are in full sunshine. Gymnadenia odoratissima flowers from May to the end of August. The specimens shown on this page where photographed in Slovenia in early June.